Bet Parlays Online, with Mobile or via Teller at Santa Anita and Del Mar! Parlay betting allows you to combine multiple races into a single bet, even if your races aren’t ordered sequentially on the card. Play Parlays at Santa Anita and Del Mar and watch your winnings grow throughout your bet! 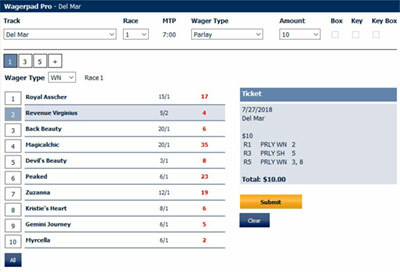 Parlay betting allows horseplayers to bet the races they want, their way. Since your Parlay races don’t have to be consecutive on the card, you can identify the horses you want to bet no matter the race they’re in. Plus, you can alternate between Win, Place and Show bets, so you can build your Parlay based on how strongly you feel about each horse. Plus, parlay wagering is the only way to roll over all of your winnings to the next bet – even the pennies. So you really are betting every penny. My preferred Parlay betting approach is to build a Parlay around my day’s ‘best bets,’ especially when they’re racing later in the card. Start a small ($10 or $20) five-leg parlay and make the first four legs Show bets on lower-priced horses. Then close it to a Win bet on the horse you like most. You just might be able to parlay your $10 or $20 base bet into a $50 or $100 Win bet on your horse just by making a series of Show bets. And if you lose along the way, you’re only out your starting amount. But if you win, you could be looking at a very nice payout. For example, Santa Anita Park, Race #1. Choose ‘PRLY’ or ‘Parlay’ on the Wager Pad and enter your first bet and base amount ($2 minimum). Press ‘+’ to add another leg and choose the Race Number and Bet Type from the dropdown. Once you’ve entered all legs of your Parlay, just click Submit like you would any other bet. Can you give a Parlay example? If Horse #3 wins Race 1 and pays $5.60 for a $2 bet, your bet will automatically roll over to $5.60 to Place on horse #1 in Race 2. If the Place payout for your horse in Race 2 is $14.80, your bet will automatically roll to Race 3, where you’ll have equal $7.40 Show bets on Horses #3 and #5. Since Race 3 is the last leg of your Parlay, your Parlay ‘winnings’ will be the result of those $7.40 Show bets. Click anywhere on the image to see larger. How many legs are in a Parlay? Each Parlay can be as few as two races and as many as six. Can I alternate between different bet types in my parlay? Yes, Parlays can use any combination of Win, Place, Show, Win/Place/Show, Win/Place, Win/Show and Place/Show bets. 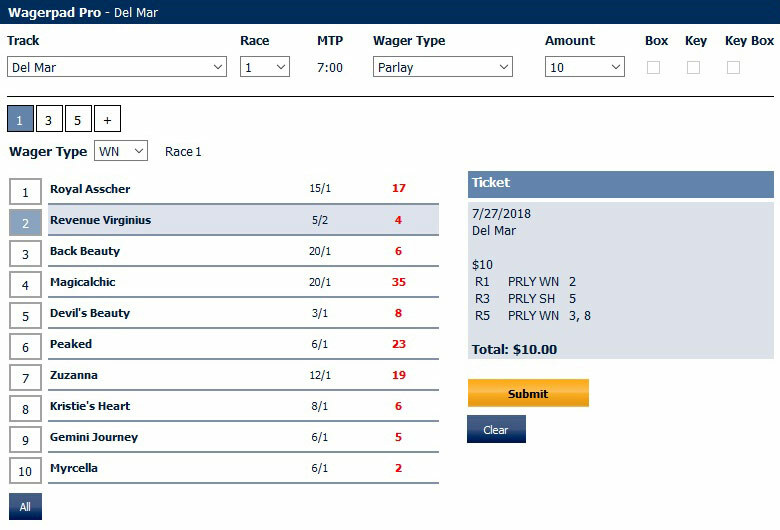 Can I use multiple horses in a leg of my parlay? Yes, you can use multiple horses in one (or more) legs of your parlay. Why can’t I bet Parlays at other tracks? Parlays are currently only available at Santa Anita and Del Mar, with more tracks to come. Can I end my Parlay early or ‘buy out’ of my bet? Once your Parlay has started there is no way to stop it early. What happens if my horse scratches in a Parlay? If all horses in a middle leg of your Parlay are scratched, that leg is treated as a refund and the total balance is carried over to the next leg. If all horses in the final leg of a Parlay are scratched, the bet pays out to your balance heading into the last leg. If you have multiple horses and just one scratches, your bet will automatically be redistributed between your ‘live’ runners.